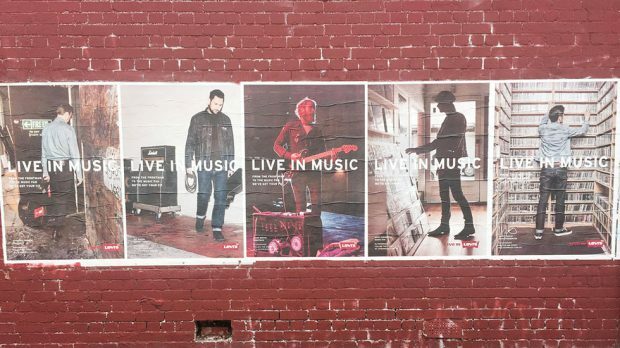 Photograph of A0 posters from Levi’s Live in Music campaign on Sydney Road, Brunswick. A damaging and frankly embarrassing advertising campaign by Levi’s has once again turned attention towards the role and impact of women in music. XANTHEA O’CONNOR looks at the importance of recognising women in the industry, an exclusionary marketing campaign that should have been aborted in its development phase and the important role industry organisations such as Brisbane’s BIGSOUND Festival and Conference can now play in making the voice of women in music louder than ever. It seemed like an obvious realisation, but one that made her finally pick up her boyfriend’s guitar that had been sitting right next to her for the last year. After seeing those girls play guitar, my friend wanted to learn to play herself. It’s not that the opportunity hadn’t been there before, but the unspoken permission had been granted; a permission taken for granted by the men around us. Women even imagining themselves with a voice in music spaces is often difficult, and those with a hard-earned voice are speaking up more and more about the inequality and double standards they face. These first-hand accounts are increasingly being backed up by statistics, with The University of Sydney and RMIT alongside APRA AMCOS releasing reports detailing gender inequity in the music industry this month. 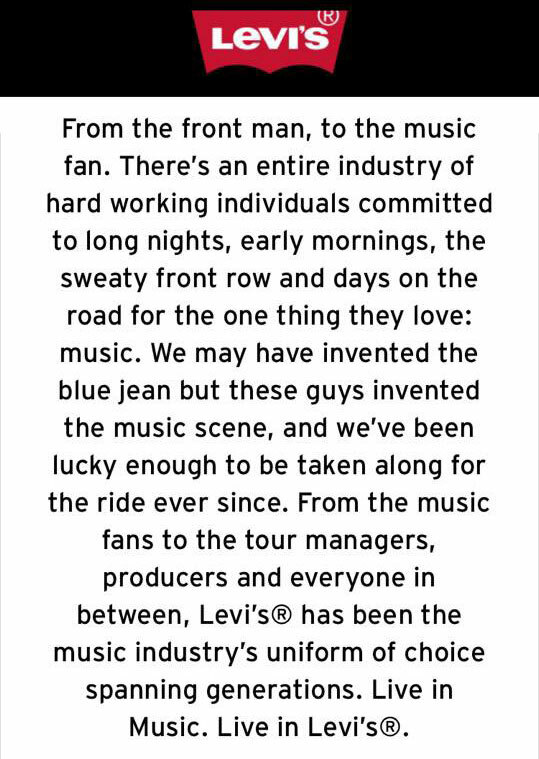 It was a particularly jarring turn of events when in this same month, Levi’s released a male exclusive love note to the music industry in the form of their Live in Music advertising campaign for their range of men’s jeans. Dirty Power Studios was quick to fire back with an amusing gender flipped silent remix of the campaign with men sound-checking for their breastfeeding frontwomen and getting excited about the new Cherry Glazerr release. Although there was great support for these defiant expressions of indignation, there remained a sense that these protests were all preaching to an echo chamber of feminists and their allies, while the campaign was overwhelming and unrelenting in its scope; from sponsored posts on social media, to the rows of AO posters lined up and down main streets and even the unwelcome clips invading the big screen before films at the cinema. Well sure, that’s indisputable, but if there was no way that this campaign could’ve been inclusive in gender due to fundamental barriers of the campaign, did the concept even deserve development in the first place? Furthermore, where were people who understand the current nuances of the contemporary music industry 18 months ago, who could’ve pointed during initial development that a male-only campaign was going to feel exclusionary to an industry that is being made particularly aware of gender-based disparity? Where were these people when the industry members were selected, to point out that all 12 Live in Levis advocates were white, cis men? Where were these people when the copy was written, to point out just how inflammatory declarations like “from the frontman to the music fan” and “these guys invented the music scene” were going to be to women working in the music industry? When the final product was going to be fed directly to this wider industry, why wasn’t a more diverse pool of people listened to before they were left outraged at the final launch, when the damage has already been done? The Live in Music launch by Levi’s has come right before the annual BIGSOUND music conference in Brisbane which they are a partner of, where they will also be giving away their inaugural Levi’s Music Prize worth an exceptionally generous $100k. BIGSOUND has been at the forefront of bridging the gap in gender inequality in music; working with leading feminist music industry body LISTEN to curate panels on gender equity for the past two years and 40% of the showcasing bands of 2017 prominently feature women and non-binary people. With so much proactive work towards gender equity, it’s going to feel incredibly incongruous to sit with hundreds of other industry professionals during the conference and watch a clothing brand regurgitate an outdated, male dominated notion of an industry that we’re doing our best to hurriedly bury and run from this September. There have been calls more widely for Australia to implement similar standards to the UK’s new gender stereotyping in advertising, and I don’t think it’s a stretch for BIGSOUND to adopt similar written expectations of their future sponsors. This could be done in a few different ways, such as a clause in their contract or have BIGSOUND staff more closely working with sponsors on their advertising material delivered during the conference. The rage towards Levi’s for creating such a campaign is entirely valid and deserves to be expressed, as it has been widely accepted that this kind of gendered advertising is damaging to women on both a personal and interpersonal level. Moving from this specific exhibition of sexism however, perhaps more attention needs to be turned to BIGSOUND and other music organisations that work with corporate sponsors. A set of standards should be devised to promote gender equity and representation in future associated corporate advertising. If companies want to align themselves with music, they should play by our rules and on our own terms. The music industry needs to work more closely with the loudest voices and the biggest marketing campaigns to ensure they never again undermine the breadth and diversity our industry is working hard to establish.